What boxes need ticking when you look for that special Greek island holiday? Most people look for: a modern villa with pool but one that feels Greek; the biggest and most dramatic sea views possible; seclusion but close to a village and beaches; privacy and tranquillity. All of our Ionian properties have one or more of these attributes but here is a shortlist for each island of the ones we consider to head the wow list. Bougainvillaea (sleeps 2) – forested, west coast hillsides and the open sea. Evangelia (sleeps up to 4) – birds eye views over Gaios port. Jupiter (sleeps up to 6) – east to the Greek mainland, north across Mogonisi Bay, west to AntiPaxos. Chimara (sleeps up to 8) – a big sea and the mountains of the mainland, framed by tall cypress trees. 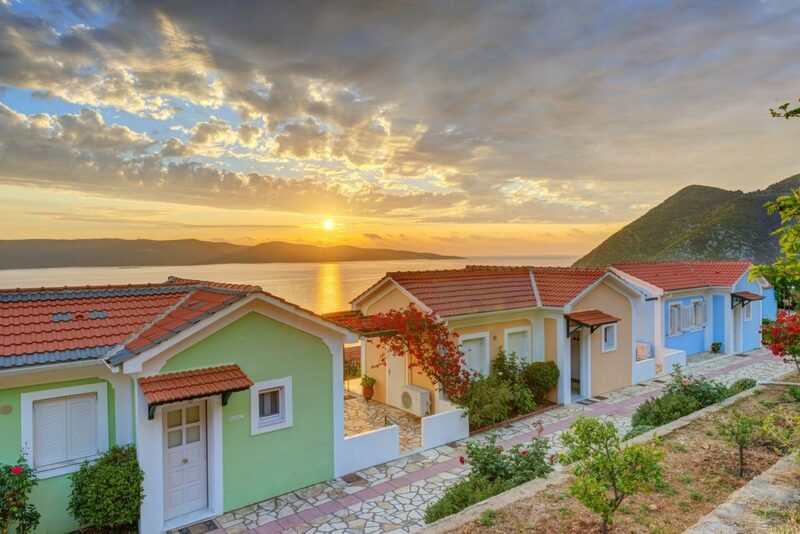 Sunset Cottages (sleeps 2) – watch the sun set behind the north coast of Kefalonia. Fassoulou’s Cottage (sleeps up to 4) – over Afales Bay and across the sea to the islands of Lefkas, Meganissi, Kalamos, Arkoudi and Atokos. Hilltop House (sleeps up to 5) – the highest spot above Kioni Bay. 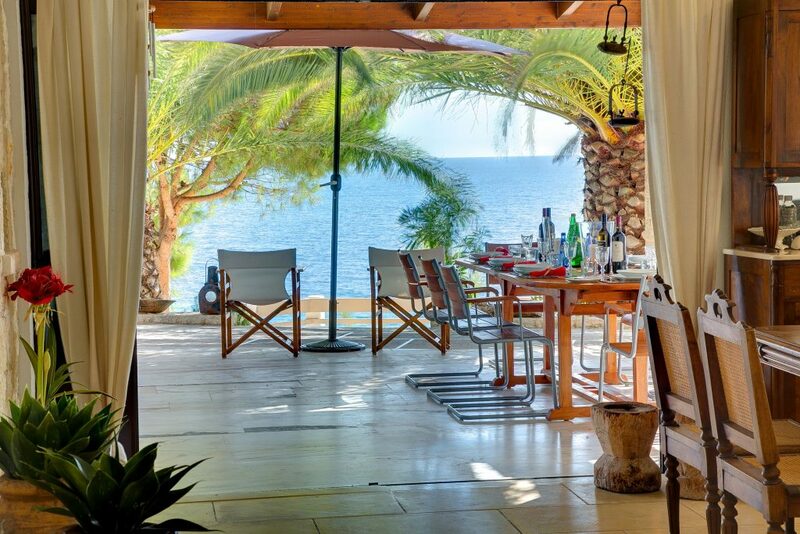 Tzika House (sleeps up to 8) – across the sea to Kefalonia’s north coast. Sonia’s Apartment (sleeps 2) – watch the fishing boats and yachts arrive at and depart from Fiscardo port. Villa Lito (sleeps up to 4) – a valley of olive groves to the sea, the pine and cypress forested foothills of Mount Aenos and the sandy coastline. 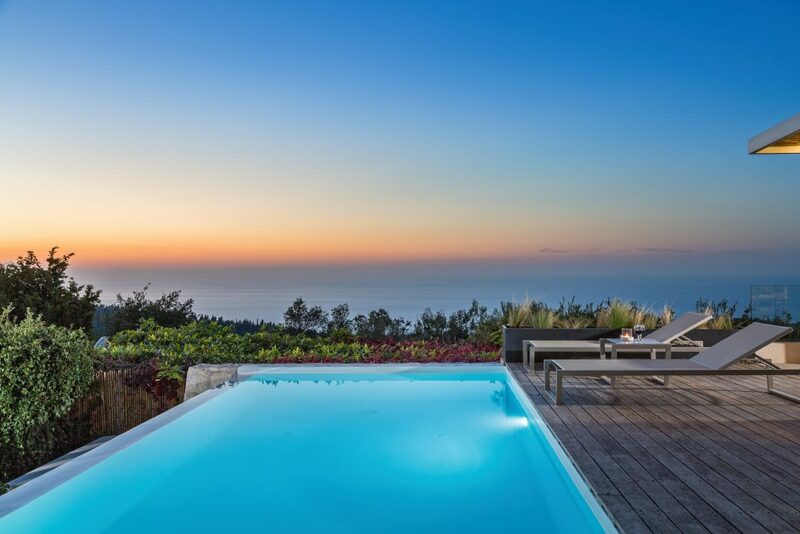 Villa Cara (sleeps up to 8) – looks out over a spectacular, natural landscape of pine and cypress to the sea and in the distance, the island of Zakynthos. Rhoda (sleeps 2) – the sun sets directly opposite. Vassiliko (sleeps up to 4) – over a valley of olive groves and across Vassiliki Bay to the islands of Ithaca and Kefalonia. 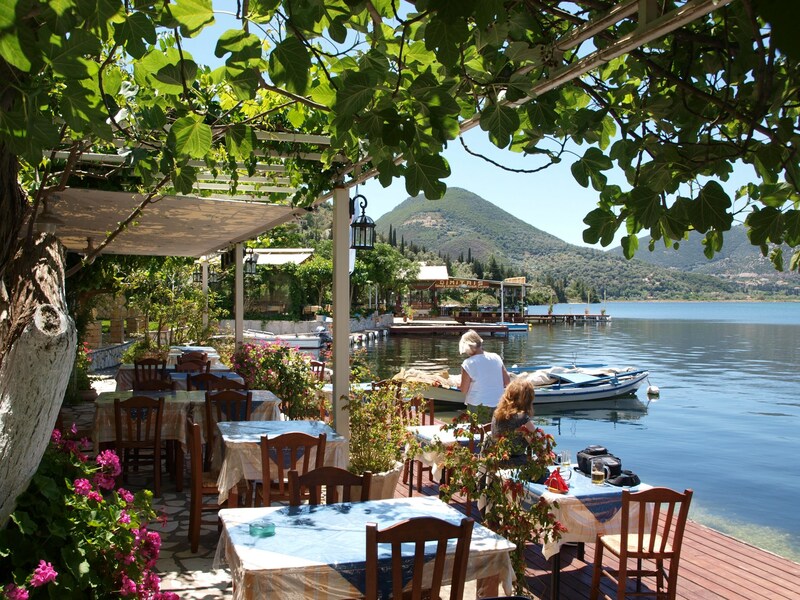 Victoria (sleeps up to 10) – across Vliho Bay and up to Lefkas’ mountainous interior. Helena (sleeps up to 10) – panoramic views over the offshore islands of Skorpios, Sparti, Skorpithi, Meganissi and across the sea to the Greek mainland. Aspro Alogo (sleeps 2) – a tiny hamlet of just a few houses in the hills above Loggos. Cressida (sleeps up to 6) – only the sound of cicadas to disturb. 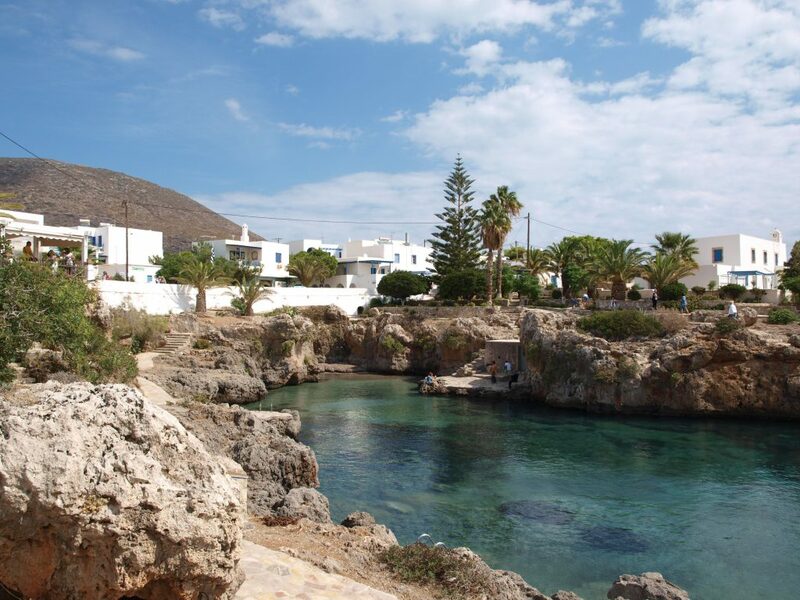 Spiantzi (sleeps up to 11) – a private headland of 2 acres and private access to the beach below. Loutsa Retreat (sleeps up to 8) – hidden from the outside world within beautiful private gardens and forested hillsides of olive and pine. Paradiso (sleeps up to 7) – a total escape with an acre of lawns overlooking a landscape of olive groves and cypress trees. Acacia (sleeps up to 10) – large, private grounds look out across the sea to the tiny island of Dias and to Zakynthos. Efkalyptos (sleeps up to 16) – a spacious and comfortable retreat above Spartia’s sandy beach. Spartia Retreat (sleeps up to 18) – surrounded by 5 acres of beautiful, extensive gardens just inland from the seaside village of Spartia. 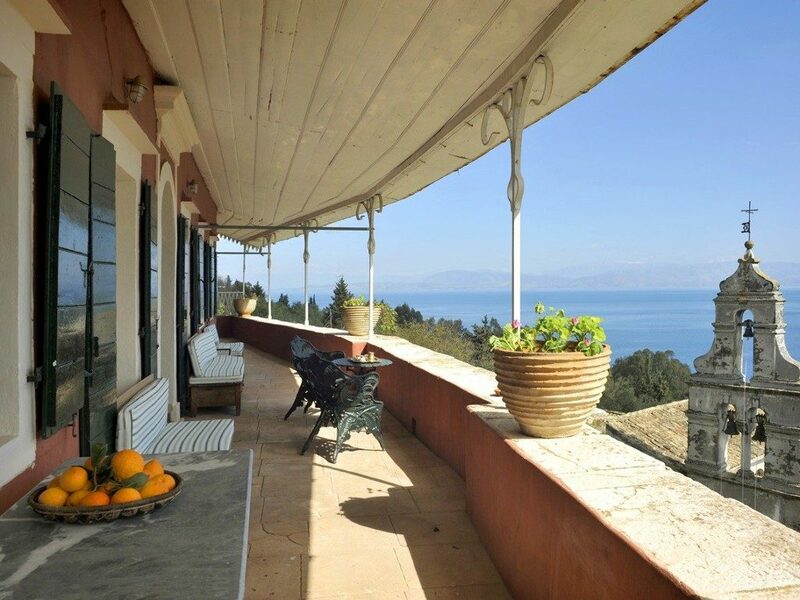 Helios (sleeps up to 8) – dramatic views all the away along the east coast to Corfu Town’s fortress. Perivoli (sleeps up to 10) – 2 acre private gardens of crimson bougainvillaea and orchards of orange, lemon, avocado, pear, apple, plum, grapefruit and a private olive grove. The Manor House (sleeps up to 10) – a mid 18th Century Venetian residence, hidden away amongst five hillside acres of citrus orchards, olive groves and cypress trees above the east coast. Mermaid Cottage (sleeps 2) – 5 paces away from the sea. Delia (sleeps up to 4) – just above Monodendri beach (Ben’s Bar). Anastasia (sleeps up to 6) – you really couldn’t get closer to the sea! Beach House (sleeps up to 7) – set above a small beach. Dexa Beach House (sleeps up to 4) – set in an olive grove, just 15 metres from the beach where Odysseus ended his odyssey. Poseidon (sleeps up to 7) – set above a small cove within the bay of Frikes. Above the Beach (sleeps 2) – bordered by gardens of fruit trees, just above the beautiful sandy beach of Makris Yalos on Kefalonia’s south coast. Villi’s House (sleeps up to 6) – from the front terrace you can hear the sea lapping on to the bathing rocks below. Lassi Beach House (sleeps up to 10) – a sumptuously comfortable home just above the sandy beach of Makris Yalos. Beach Villa (sleeps up to 12) – a private pool just above Makris Yalos sandy beach. Our newsletter brings you Warm Wishes and a Few Things New for the New Year. Our office has some new family faces. 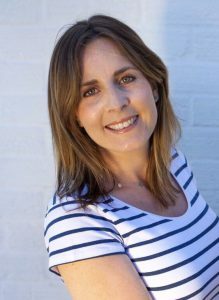 Alex’s wife, Catherine, has joined our team. Catherine (Cat) has spent three years on Paxos as a Representative for Ionian Villas and Scott Williams. She has visited the other Ionian islands and will be revisiting in May. 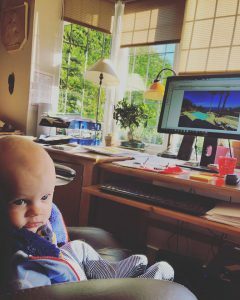 Alex and Cat’s son, Archie, was born last September and will be on the May familiarisation trip to the islands! For us, 2017 was the busiest and also the longest season – May and October in the Ionian are becoming more popular for warm weather escapes from more temperamental northern European climates. Mermaid Cottage on Paxos has Loggos waterfront as a doorstep and in May is £570 per week. Katy’s Apartment on Kefalonia has Fiscardo as a doorstep and is £500 per week in May. Avra for up to 5 people. Elpitha for up to 5 people – and its sister villa Simeoni. Kolomboki for up to 6 people. 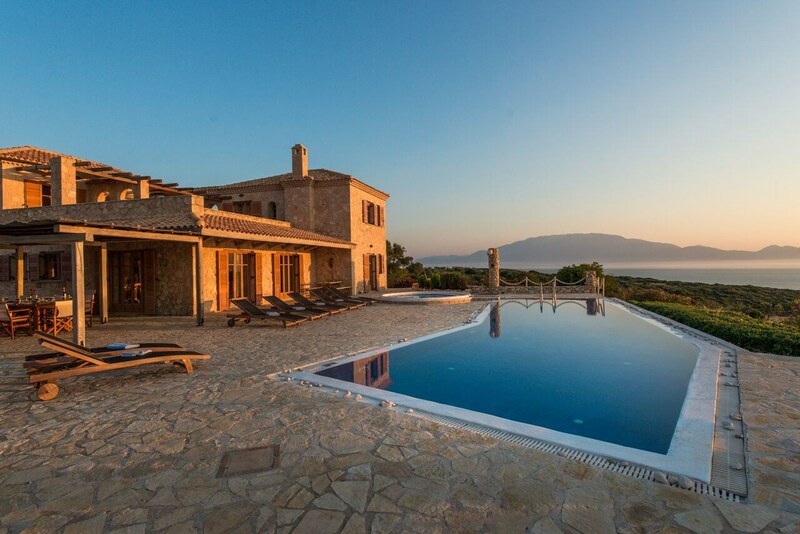 Korpithi for up to 4 people – and its sister villa Loula. The Levrecchio Villas – 3 adjacent villas each for up to 4 people. Petrino Spiti for up to 10 people. Polimnia for up to 6 people. Valentina for up to 4 people. Zoe for up to 6 people. Areti for up to 7 people. Limonia for up to 8 people. The Loutsa Retreat for up to 8 people. Frappa for up to 8 people. Frappa Cottage for up to 3 people. Grace for up to 6 people). Paradiso for up to 7 people. Rea for up to 4 people. Sea Breeze for up to 12 people. Sonata for up to 6 people. Perivoli for up to 10 people. Inter-island communications are improving. 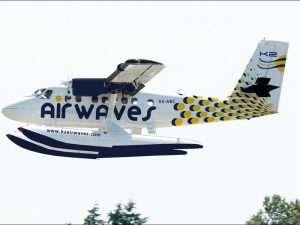 For 2018 there is talk of the seaplane returning to link Corfu and Paxos and possibly the other more southern Ionian islands. We have also heard that a new ferry is being operated between Corfu, Lefkas, Kefalonia and Zakynthos. Sky Express already operate a flight linking Corfu, Preveza (for Lefkas), Kefalonia, Zakynthos and Athens. Apart from the regular inter-island hydrofoil and ferry services it is now possible to charter a private speedboat. We understand that an island hopping holiday may not appeal to families wanting to limit overall travel but with this new choice of transferring from one island to another it can be seen as an exciting alternative. 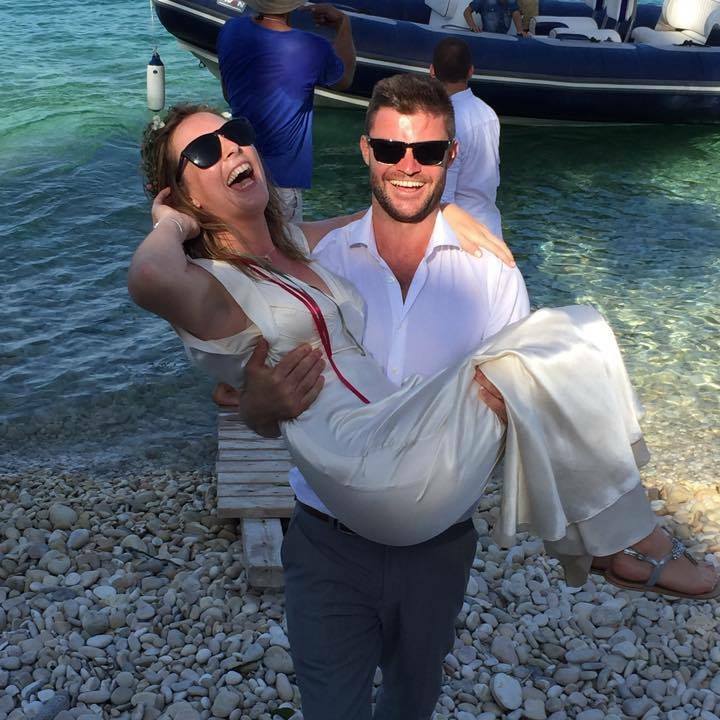 And if you are a couple with more flexible time on your hands – let us know if you would like us to tailor-make an Ionian Island Hopping trip for you. Talking about flights – there’s a new BA flight from Heathrow to Kefalonia starting mid May 2018 – Tuesday and Saturday departures. 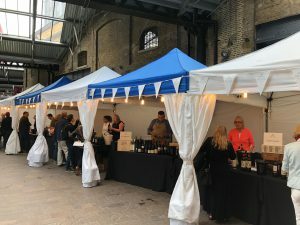 In October last year we went to the London Greek Wine Festival at the West Handyside Canopy in Kings Cross and sampled many of the 130 distinctively delicious and diverse Greek wines being showcased. The Festival, organised by The Greek Larder will happen again next October so check their websites for dates. 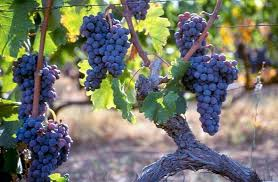 For many of us it is difficult to know what wines to sample when on holiday in Greece. The ubiquitous and often bland “house wine” poured from taverna boxes will not show off what Greece is now producing. On Paxos there is now an opportunity to explore the tastes of the grapes, regions and wineries of Greece from the comfort of your holiday villa. Andreas stocks some excellent wines from wineries he has selected from his annual research trips (someone’s got to do it!). He has his wine shop in Lakka but with a few days notice he can bring a selection of wines to your Paxos villa. He will give you an interesting history to the making of each wine. Best to give him a few likes & dislikes so he can tailor the selection for you. Then – when you return to Paxos for your next holiday you can arrange for Andreas to deliver your favourite wines for your arrival! The Palace and gardens of Mon Repos, surrounded by hillsides of pine forest, stand above the sea on the outskirts of Corfu Town. Mon Repos Palace was built as a summer residence for the British Lord High Commissioner of the United States of the Ionian Islands in 1828. When the Ionian islands were ceded back to Greece in 1864, the Palace became the residence of Greece’s King George 1. The Greek royal family used it as a summer residence up until King Constantine II fled the country in 1967 and the Palace was repossessed by the Greek State. Several royal births have taken place at the villa, including those of Prince Philip, Duke of Edinburgh on 10 June 1921, and Princess Alexia of Greece and Denmark on 10 July 1965. The Palace and its gardens are now being used as an archaeological museum. 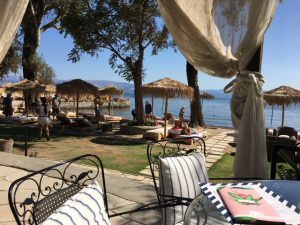 At the foot of the Palace’s forested hillside a sheltered beach, once the bathing spot for the Greek royal family, is now open to the public and has an excellent café bar and restaurant. 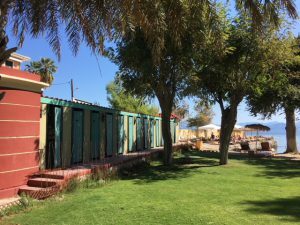 “The Royal Baths” is close to Garitsa waterfront but its walled gardens (bordered by around 50 old-school, wooden changing huts) are a peaceful escape from the world outside – well worth a visit if you have time on Corfu. If you feel like a return to the Ionian this year and need some ideas – call us! If you have time – add us as a friend on Facebook and give us a Like or follow us on Instagram for some Ionian holiday inspiration! We wish you all the very best for 2018 – may all your dreams come true! David, Vivienne, Alex, Cat & Archie. Ionian Villas is coming up to its 5th birthday. With a big thank you to our guests over these 5 years, our Ionian programme has grown to feature over 200 properties. We continue to visit all the properties each year. 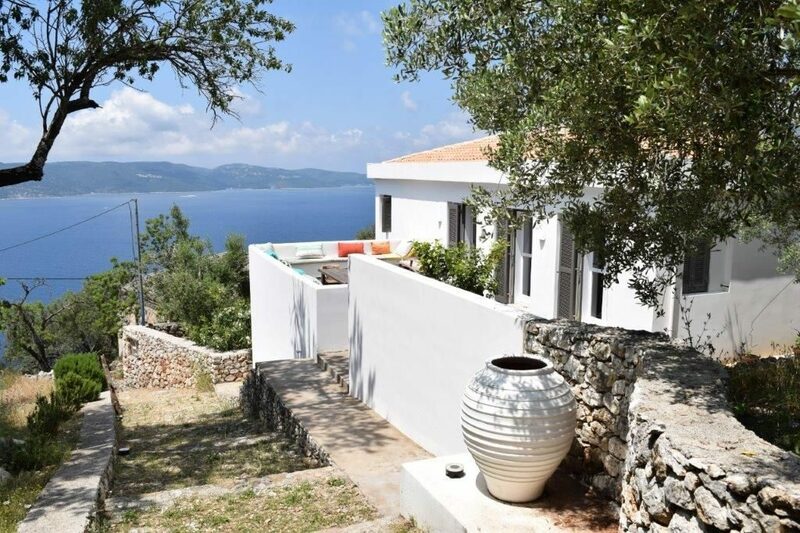 1-bedroom properties: Olitsi Apartment on Paxos; Lydia on Kefalonia; Fassoulou’s on Ithaca. 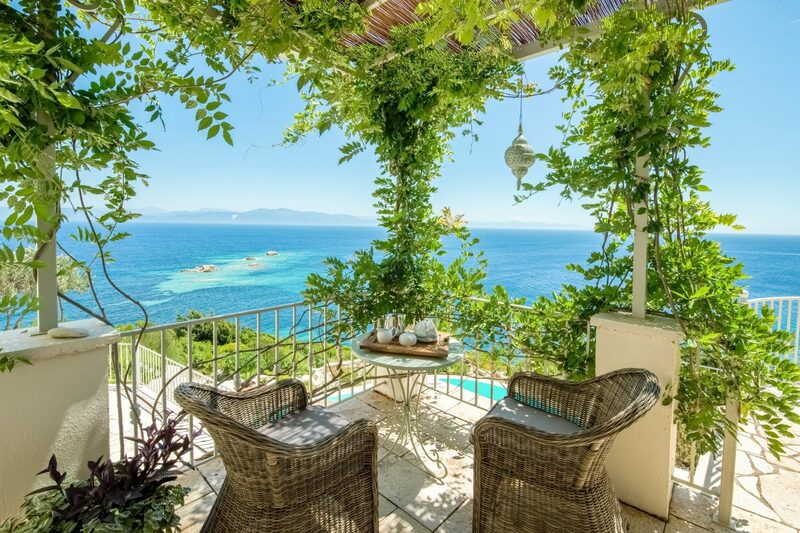 2-bedroom properties: Angelika on Paxos; Bougarini on Paxos; Delia on Paxos. 3-bedroom properties: Agni Bay on Corfu; Anetta on Corfu. 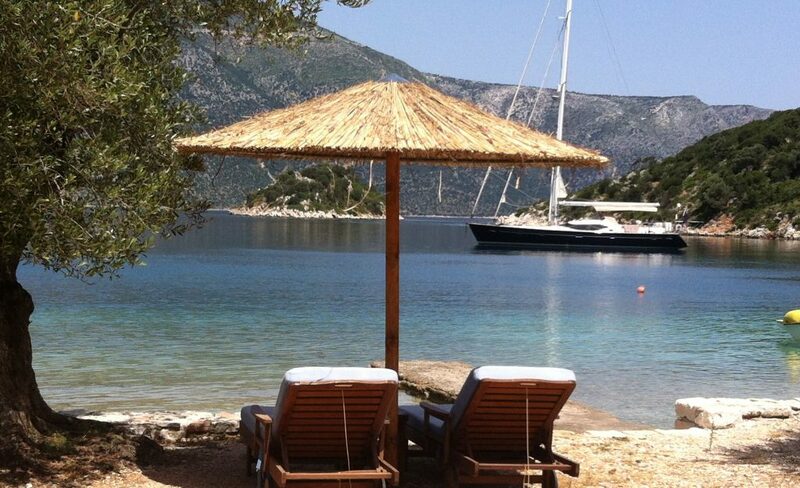 4-bedroom properties: Chiara on Paxos; Beach Villa on Kefalonia. 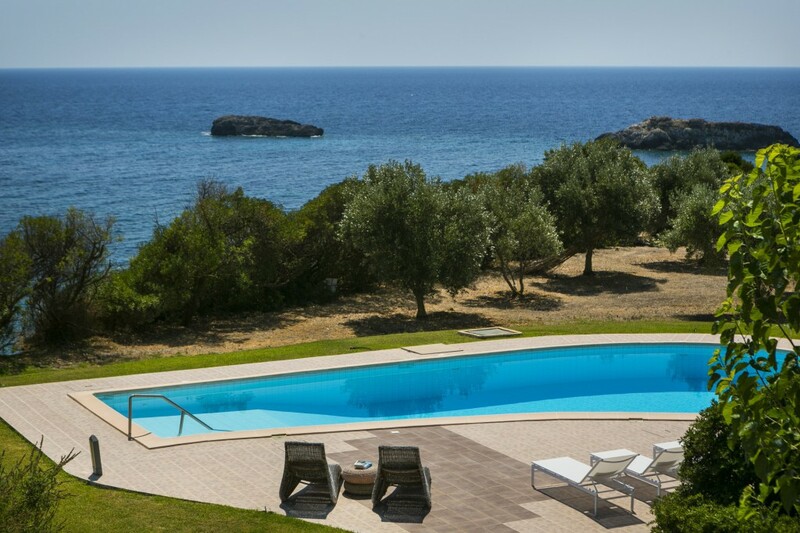 6-bedroom properties: Athanasia on Paxos. 7-bedroom properties: Marina on Paxos. Kythira. 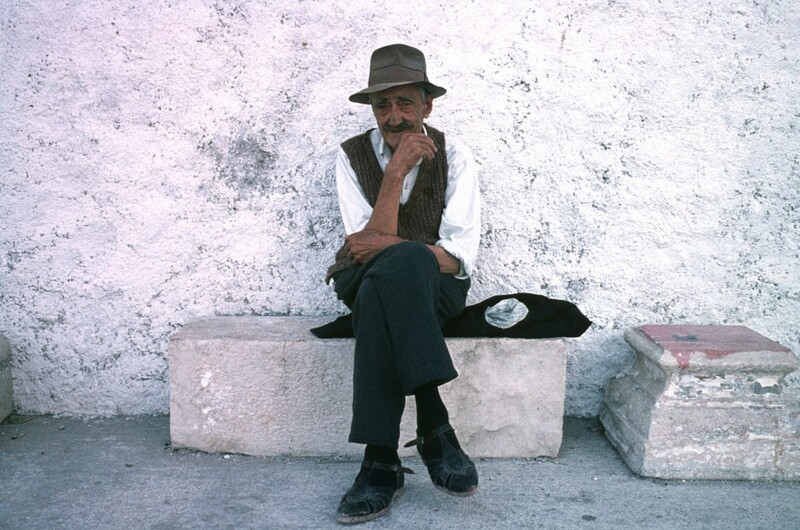 In the earlier days of Greek Islands Club, before it became part of a larger corporate image, we started a small programme on the southernmost Ionian island: Kythira. We returned to Kythira in October this year to meet up with old friends. We were delighted to see that little, if anything, had changed in the past 25 years. We will be introducing our Kythira programme in the new year. Kythira is not for the package holidaymaker or the lover of swimming pools and will appeal to the more intrepid Grecophile. Holiday Snaps. We are keen to add your holiday photos to our website. If you have any images, which you would like to share – please send them to us in an email. What is happening in Greece today? The UK’s media coverage of life in Greece is often scant. Very few of us know and understand how austerity measures are affecting the Greeks. Greek Crisis is a blog dedicated to the understanding of the current Greek (but also European) economic, political and institutional crisis. It was created by Prof. Aristides Hatzis of the University of Athens, after many requests by his students seeking a source of reliable analysis on the Greek current affairs. Its aim is to post commentary and reports published mainly in the major U.S., European and Greek media and to encourage a rigorous discussion. Walking on Paxos. Before roads were built on the islands, communication between island hamlets and villages was via a network of pathways. Many of these paths have become overgrown or the stone walls on either side have collapsed, making access difficult. 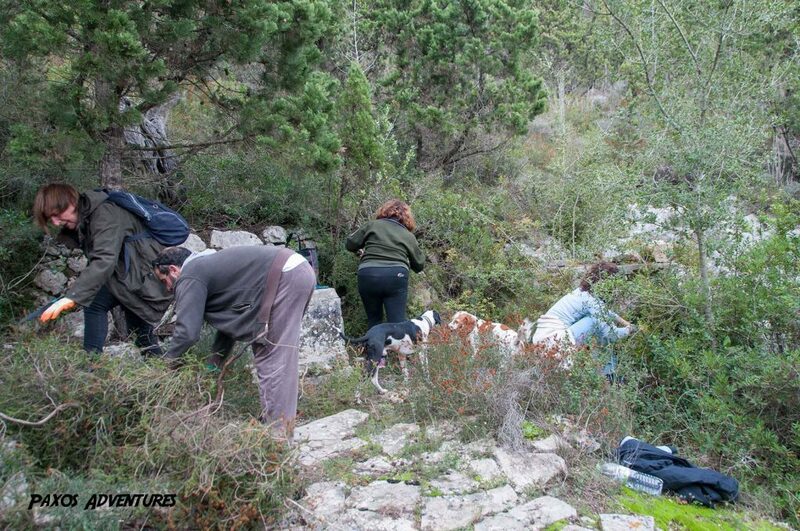 On Paxos, a hard working group of locals are clearing these paths so that eventually all parts of the island can be reached on foot. 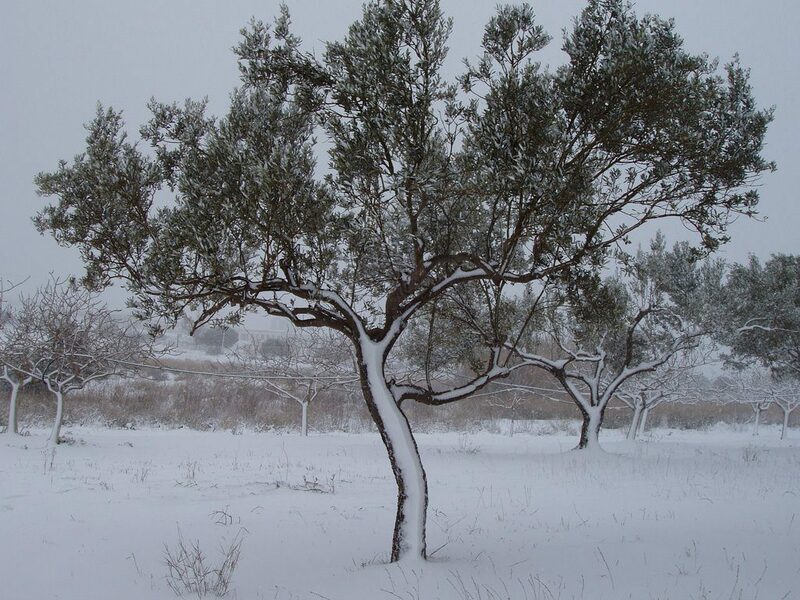 Come to Paxos in May and explore olive groves coloured by a profusion of wild flowers. 2 people staying at Olitsi Apartment 8th to 15th May would pay £225 per person for the apartment and an Easyjet flight for around £150 each. We hope to see you again on one of the Ionian islands – do get in touch if you would like us to search for a special island escape. Vivienne, Alex and I wish you all a very Happy Christmas. Fiscardo is undoubtedly one of the most colourful and prettiest ports in the Ionian. In 1953 an earthquake destroyed all Kefalonia buildings except those in Fiscardo and a few outlying villages. 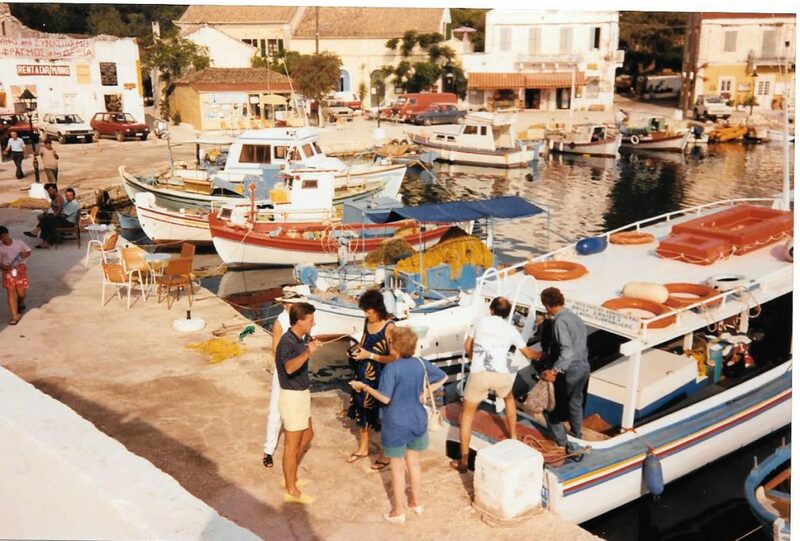 In my early Greek Islands Club days we took on a small programme of village houses for those visitors wanting to spend lazy days people and boat watching on Fiscardo waterfront. 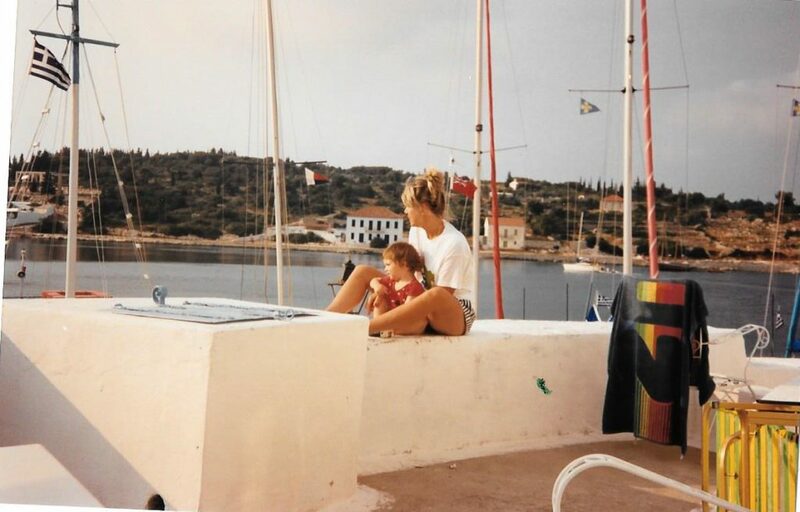 In the early 1980’s a coffee on Fiscardo waterfront would have cost around 25 cents in today’s money. Many of the Greek islands still hold on to a simple lifestyle and do not let the demands of blinkered tourism dictate their future. But whereas an older island generation may not want change, the younger generation will naturally be aspirational: the BMW versus the donkey. Running a travel business often leads one to hypocrisy. I always tried to offer holiday opportunities to those wanting to escape the crowds and to get to know and be part of a simple Greek island community. In 1990 the BBC Holiday Programme asked me if we would host a film crew in Fiscardo. I said yes. Holiday bookings to Fiscardo soared the following year and Fiscardo started to take on a more chic appearance. A coffee on Fiscardo waterfront can now cost 4 Euros. 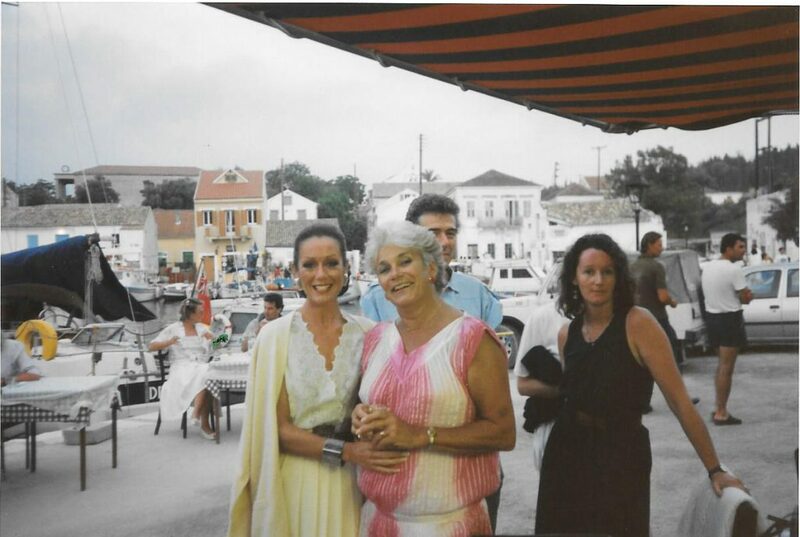 The following photos were taken in 1990 when my mum (Buz), my wife (Vivienne) and I introduced Lorraine Chase (as the Presenter), a BBC researcher plus a cameraman and sound man to the beautiful landscapes of northern Kefalonia and Fiscardo. You will see that there were only a very few café bar tables and chairs and wooden fishing boats outnumbered fibreglass cruisers. There were also no waterfront sun umbrellas. Today’s waterfront wall of sun umbrellas provide welcoming shade but I still prefer the openness that existed pre-invasion and also the look of traditional, rickety cafenion chairs and chipped metal tables. But life goes on and Fiscardo will still dazzle and delight. Vivienne and Alex at Villa Theodora – this is now a waterfront bar. Another year goes by and despite the unrest in different parts of the world, now is a good time to make plans for one or more escapes in 2016. 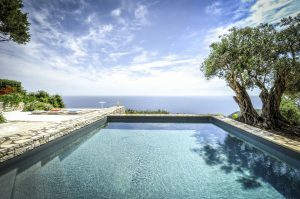 Our finger on the pulse of holiday bookings to the Greek islands tells us that the larger villas in August are being taken up quickly and the month of June is proving to be very popular. I recently read, in a Sunday broadsheet, a review of travel destinations according to a “risk of terrorism” scale of 1 – 10. Many of the destinations were around the 5. I do not know where the Ionian islands of Greece would appear in this scale but I would imagine that they must be amongst the safest destinations to visit. Sitting on a terrace overlooking a still sea with the soft scratching of olive grove cicadas and just the worry of which waterfront taverna to visit later – one can’t help but detach oneself from the outside world. I have met many people who choose not to spend a holiday on a small island because they feel that there are too many limitations – the same views, the same food, the same daily routine – boring and “uneducating”! 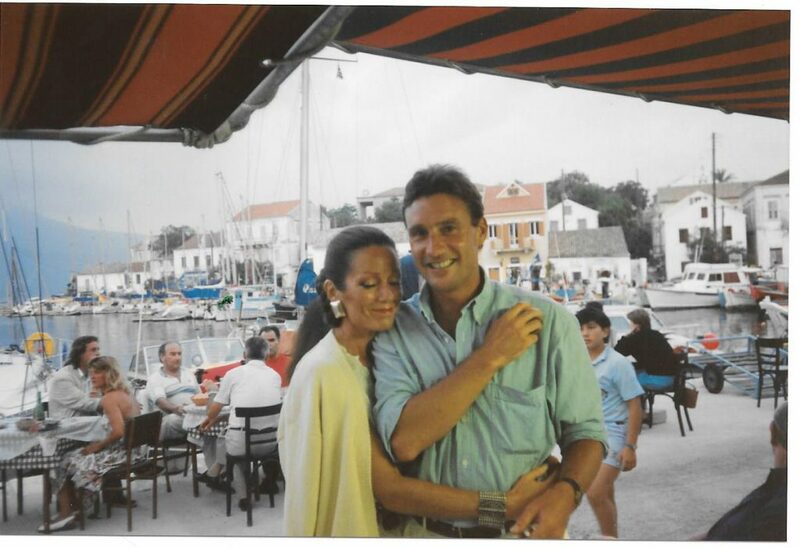 Every year over the last 50 years I have spent on average 2 – 3 months on Paxos. There are many hidden parts of the island that I have not yet found; all the views are constantly changing with the position of the sun, the movement of the sea and silver olive trees; the food has nearly always been fresh, inspired, colourful and delicious. I love my short breaks on islands like Paxos and after each visit I feel recharged, refreshed and educated in the simple things in life, which so often pass me by in a more frenetic lifestyle back home. For 2016 we have added a new Ionian island: Zakynthos – direct flights (Easyjet and charter) – Villa Amphitriti sleeps up to 14 people and has a TV monitor showing live footage of local seals and starfish from a nearby underwater camera. We feature 10 villas and will be adding more next year. 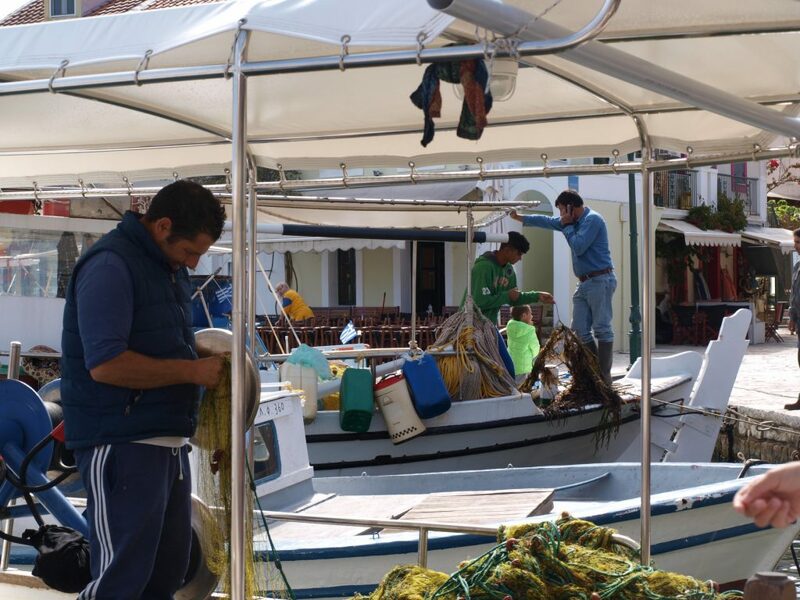 There is a ferry service between Agios Nikolaos (North Zakynthos) and Pessada on Kefalonia – taking 1 hour. As Easyjet operates to both islands you could fly to Zakynthos for a holiday and then on to Kefalonia, flying back to UK from there. On Paxos, Aspro Alogo – 1-bedroom hideaway cottage above Loggos. On Kefalonia, Marika – a 2-bedroom villa above a sandy beach. On Kefalonia, The Fiscardo Suites – luxury Suites in the centre of Fiscardo. On Meganissi, Eftihia – 1-bedroom villa close to the sea. On Paxos, Alexia – hillside olive groves above Lakka Bay. On Paxos, Erato – coastal villa just outside Gaios. 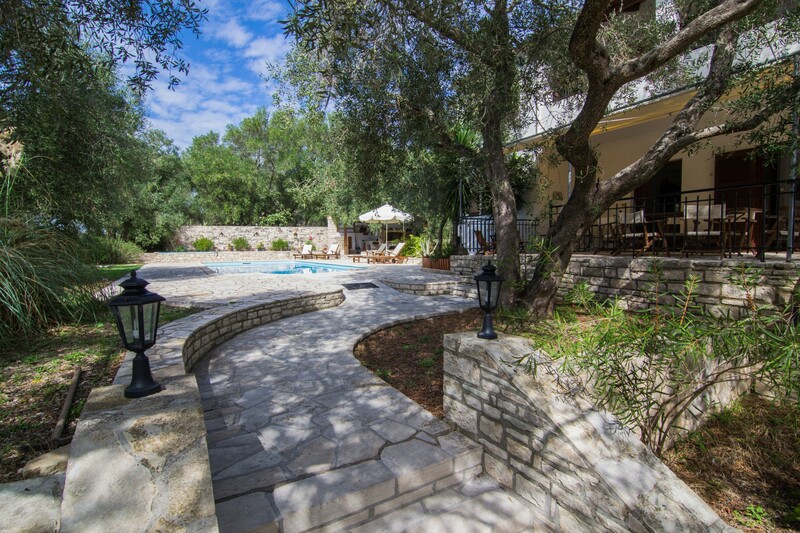 On Paxos, Kallisto – reasonably priced villa close to Magazia. On Paxos, Stassinos – close to Lakka. On Paxos, Portokali House – a comfy house just outside Gaios. On Kefalonia, Villa Amalthea – modern villa above a sandy beach. On Corfu, Perivoli – a 300 year old property with beautiful gardens. On Lefkas, Nichola – amazing sea views. On Ithaca, Mavrouna – short walk to a beach. On Paxos, Aetofolia – possibly the best views over Gaios’ Venetian fortress. 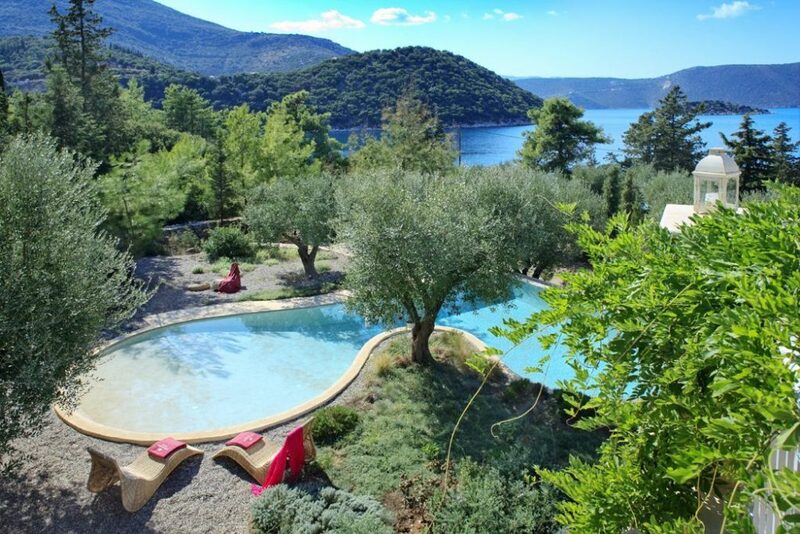 On Kefalonia, Acacia – sprawling villa with huge pool close to a sandy beach. On Lefkas, Ophelia – spacious retreat with powerful views. 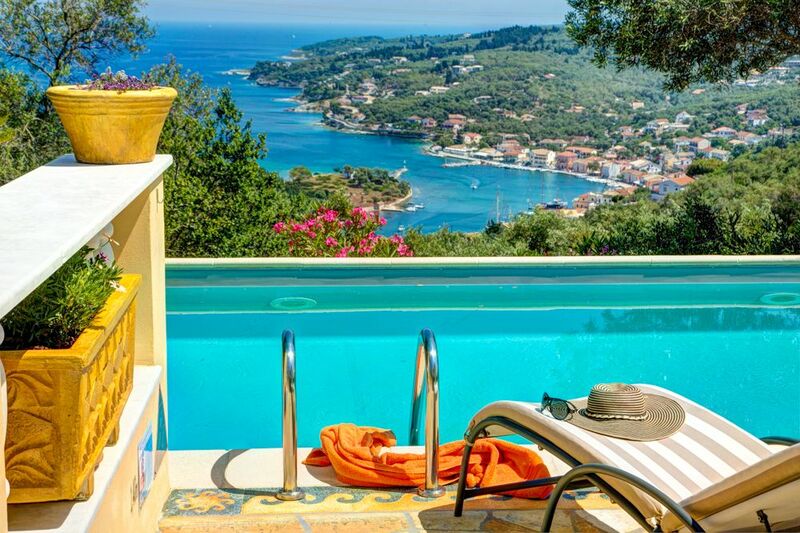 On Paxos, The Old Residency – fantastic apartment for 6 on Gaios waterfront. On Kefalonia, Villi’s House – just a 5 minute walk to Fiscardo waterfront. On Ithaca, Poli Beach House – just above a beach & close to village tavernas. In 2011 Ionian Villas began with me and my wife, Vivienne. Our son, Alex, has added to his education by working on Paxos as a waiter, a boatman, a dancer, a hamper organiser, a Rep and then for the last 2 years as our Ionian Villas Paxos manager. Alex now joins us back at our Felpham (West Sussex) HQ and Dimitris Aronis becomes our new Paxos manager. We would love to see your Ionian island photos. Our Photo Competition offers a 1st Prize of a “10% Off” Voucher (redeemable on any of our properties in 2016) and the 2nd and 3rd Prizes are each a case of 12 bottles of Prosseco. Photos can be of any subject but in some way should give a flavour of the Ionian island. Only “Landscape” format, colour not black & white and any number of entries. We will be setting up a website page just to show a selection of these photographs so by sending us your photos you give us the authority to use each photo. We will not pass on any photo to any third party. This Blog is being sent to our Ionian Villas guests but the competition is open to anyone who has visited any of the Ionian islands. The Competition closes on 1st March 2016. There are now 3 different hydrofoil/ferry services between Corfu and Paxos so most morning flight departures from UK will allow Paxos clients to reach Paxos the same day. More and more of our Paxos clients are opting to take a flight departing at a “reasonable” time from UK and not at the crack of dawn and staying overnight in Corfu Town before catching an early afternoon hydrofoil to Paxos the following day. 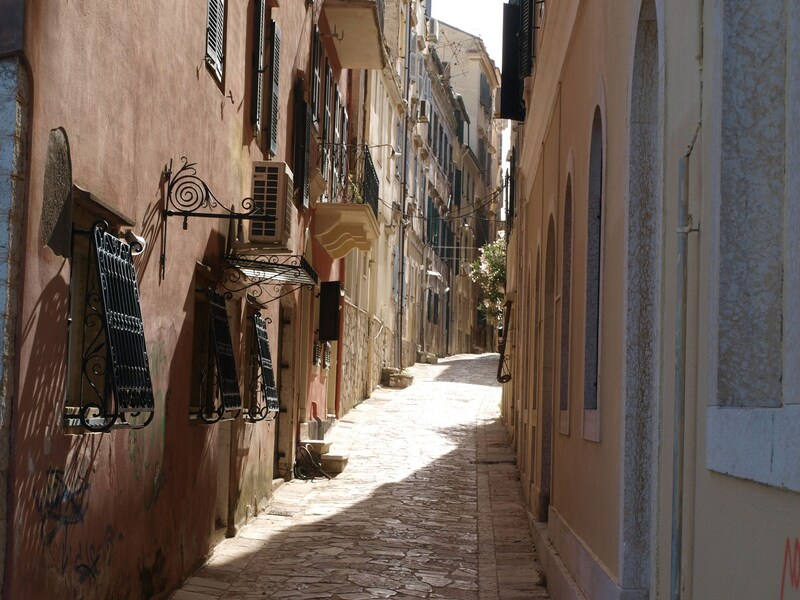 Corfu Old Town is a fascinating mix of the old and the new. Italian and French occupations have left a legacy of beautiful architecture and there are now many excellent restaurants and bars. As an alternative to rushing over to Paxos in one day, why not choose from our selection of Corfu hotels (see below), which are all within a 5-minute taxi ride from the airport and a 10-minute taxi ride to the Paxos hydrofoil. Please get in touch for hotel room prices. On most days there are fairly regular ferries between Corfu and Paxos (also hydrofoil), Kefalonia and Ithaca, Kefalonia and Zakynthos, Lefkas and Meganissi. There are also private speedboat charter services if you don’t want any waiting around at the port. Please ask us for more information. Not Sure What to Buy Her for Christmas? Auree Jewellery has a sparkly selection of surprisingly inexpensive ideas to show that you care. Their website also has a selection of compressed, easy-to-read travel guides including one for Paxos. 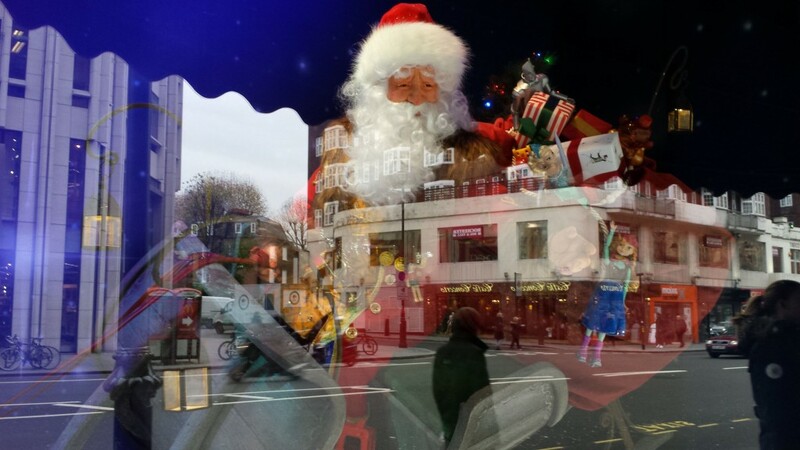 We hope you have a very Happy Christmas.